For increased security, you can run MyCrypto locally on your computer with our desktop application. The computer should have no internet connection. You can generate a wallet completely offline and send transactions from the "View & Send" page. In order to setup your local MyCrypto, start off by downloading the latest release of the desktop application here, be sure that you see the green "MyCrypto, Inc [US]" bar in the url bar, don't see it? Additionally, check the signed checksums, we made a guide about verifying the authenticity of the desktop app here. Move the downloaded executable to a USB stick or something similar, in order to move it to your offline computer. Plug the USB stick into your offline computer, and move the executable to a place where you can easily find it on your offline computer. To open the MyCrypto application, double click the executable. This should open up a new window on your computer with the local version of MyCrypto running. You will get a warning saying that it is unable to connect to the network, but this is completely normal. 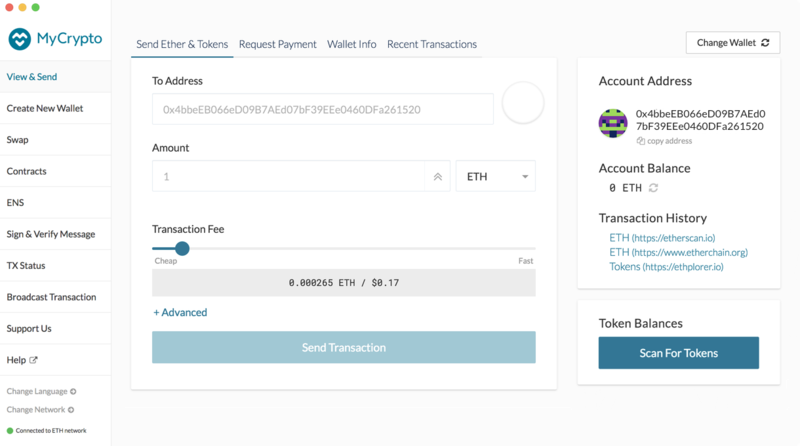 You won't be able to see your Ether or token balance through your local MyCrypto, but you can still use Etherscan or Etherchain to see your balance. The application will let you know in case there is a new update available. To update, simply download the newest version on download.mycrypto.com, and check that the certificate in the URL bar is correct (MyCrypto, Inc [US]).